Saturday, January 19, 2019 – Bell MTS Place, Winnipeg, Man. 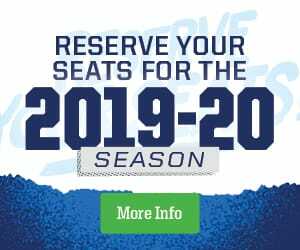 The Manitoba Moose (18-18-2-1) pushed back to the .500 mark with a 4-1 victory over the San Antonio Rampage (21-19-1-0) at Bell MTS Place on Saturday afternoon. The Moose didn’t waste any time, opening the scoring just 10 seconds into the game. Jansen Harkins dug the puck off the wall and put a cross-ice pass to Logan Shaw who snapped a shot past Jared Coreau. Despite the quick offensive start, Shaw’s tally would be the only goal scored in the period. Manitoba only allowed three shots in the frame, all stopped by Eric Comrie, while Coreau turned away the next eight Moose attempts for a 1-0 score after 20 minutes. San Antonio evened things up 1:26 into the second as Austin Poganski finished off a Joey LaLeggia centering pass. Manitoba got back in front 8:16 into the period when Kristian Reichel sprung Hunter Fejes on a breakaway, and Fejes buried the opportunity for a 2-1 Moose lead. The Rampage nearly tied the contest again, but Comrie and defenceman Charles-David Beaudoin combined to keep the puck out during a mad scramble in front of the Moose net. Comrie made 15 saves in the period to help the Moose carry the 2-1 lead to the break. San Antonio continued to pour offence toward the Moose net, but Comrie stood tall. The Manitoba netminder stopped 19 shots in the third for a 37-save total through 60 minutes of action. Brent Pedersen gave the home-side some breathing room with three minutes to go, depositing his own rebound into the Rampage net. JC Lipon tacked on an empty netter as the Moose claimed a 4-1 win. Logan Shaw’s goal 10 seconds into the game is the fastest opening goal in franchise history. The Moose have points in six straight games (5-0-0-1). Jansen Harkins set a new career high with his 14th and 15th points of the season. Chris Collins made his AHL debut, recording one shot on goal and a plus-one rating. Hunter Fejes scored his first goal with the Moose. The Moose close out their six-game home stand Sunday afternoon with a rematch against the Rampage on Star Wars Day., featuring a post-game Autograph Alley. Tickets for the 2 p.m. matchup are available at moosehockey.com/tickets.